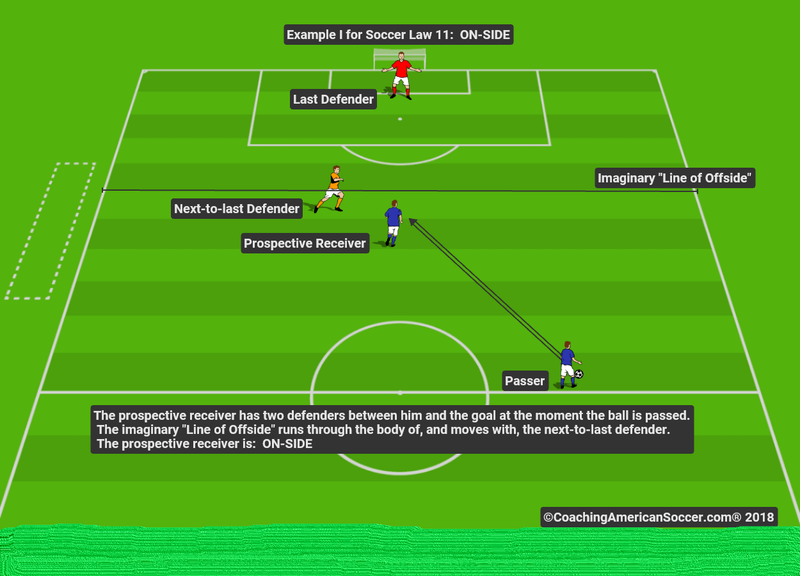 There is a basic scenario in soccer that illustrates the majority of offside cases. 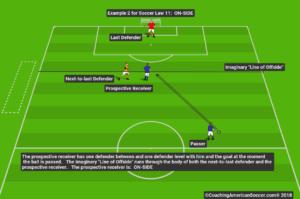 This discussion is a follow-on to the CoachingAmericanSoccer.com® presentation, “Introduction to Offside – Law 11.” Please review that presentation to ensure that you understand the concept of the “Two-Question Test” before continuing. 3.) 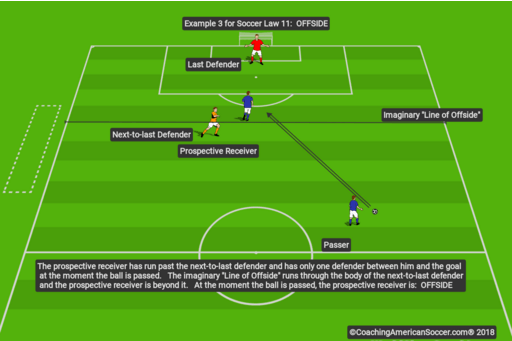 A striker, who is going to be the intended recipient of an imminent pass, has just started a run toward open space that is behind the next-to-last defender. 4.) 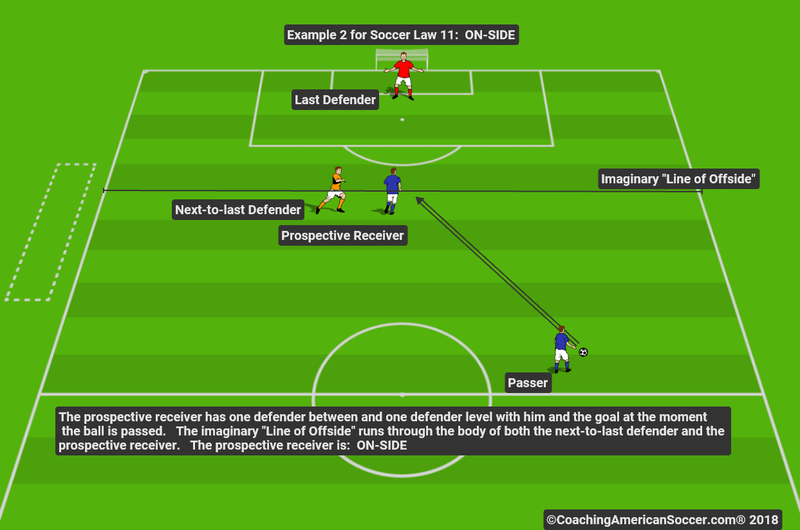 A midfielder, who is a teammate of the striker, passes the ball to the striker. Remember, “Offside” is an instantaneous decision made by the Assistant Referee, who has to be in the correct position in line with the next-to-last defender and simultaneously correctly sees the position of the striker at the same time that the ball is struck by the midfielder, and then raises or does not raise the flag. Then, the decision must still be agreed upon by the Referee. Decision – The striker is NOT OFFSIDE. The striker is ONSIDE. No violation of Law 11 has occurred and play is to be allowed to continue. The flag stays down. Decision – The striker is OFFSIDE. The Assistant Referee raises the flag. The Referee agrees with the Assistant Referee. A violation of Law 11 has occurred. The Referee blows the whistle and play is stopped. 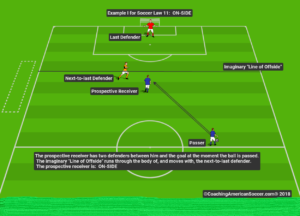 An indirect free kick is awarded to the defending team at the spot where the striker was when the midfielder kicked the ball. 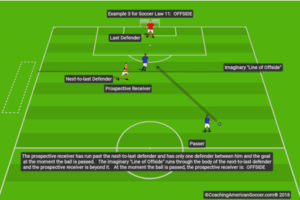 – It is critical that players on both offense and defense be taught not to assume that an offside call will go one way or the other and to continue to play until the whistle sounds.